The USA: Most linguistically diverse country on the planet? Author SeanPosted on 19 September, 2011 Categories UncategorizedTags Edinburgh University, endangered languages, evolution, Guinea, New York, population, USALeave a comment on The USA: Most linguistically diverse country on the planet? Spatial orientation is crucial when we try to navigate the world around us. It is a fundamental domain of human experience and depends on a wide array of cognitive capacities and integrated neural subsystems. What is most important for spatial cognition however, are the frames of references we use to locate and classify ourselves, others, objects, and events. Often, we define a landmark (say ourselves, or a tree, or the telly) and then define an object’s location in relation to this landmark (the mouse is to my right, the bike lies left of the tree, my keys have fallen behind the telly). But as it turns out, many languages are not able to express a coordinate system with the meaning of the English expression “left of.” Instead, they employ a compass-like system of orientation. 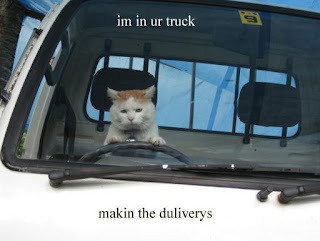 They do not use a relative frame of reference, like in the English “the cat is behind the truck” but instead use an absolute frame of reference that can be illustrated in English by sentences such as “the cat is north of the truck.” (Levinson 2003: 3). This may seem exotic for us, but for many languages it is the dominant – although often not the only – way of locating things in space. What cognitive consequences follow from this? There have been some very interesting discussions of the relationship between language and thought recently, including for example, Sean’s absolutely fascinating series of posts about the evolution of colour terms, a great post on descriptions of motion in different languages over at the lousy linguist (here), Guy Deutscher’s article “Does Your Language Shape How You Think?” (for discussions, see e.h. here and here), a slightly less recent piece by Lera Boroditsky in the Wall Street Journal, and an excellent recent discussion of her article by Mark Liberman (here). (see also James’ post, including a great/terrible joke about Whorf). As I’ve written a bit about this topic on my other blog, Shared Symbolic Storage, I’ll repost a short series of posts over the next couple of days. As Deutscher said, this is a very fascinating avenue of linguistic research that gives much insight into the nature of language and cognition as well as their relationship. In addition, it also presents us with new facts and considerations we have to take into account when we think about how language and cognition evolved. Hat tip to Evolving Thoughts.